.....this idea occurred to me. I paused the movie, went to make tea, then I went upstairs try it out. I worked! Nowadays I use it almost every time. It makes it super easy for me to achieve that precise Cut Crease look, especially since I don't have a deep & defined crease line. Place eyelash curler on the outer corner of your eye, aligning it from the bottom lash line straight towards the end of your eyebrow. Place the tip of curler till your crease, or where you want to wing of the eyeshadow to end. 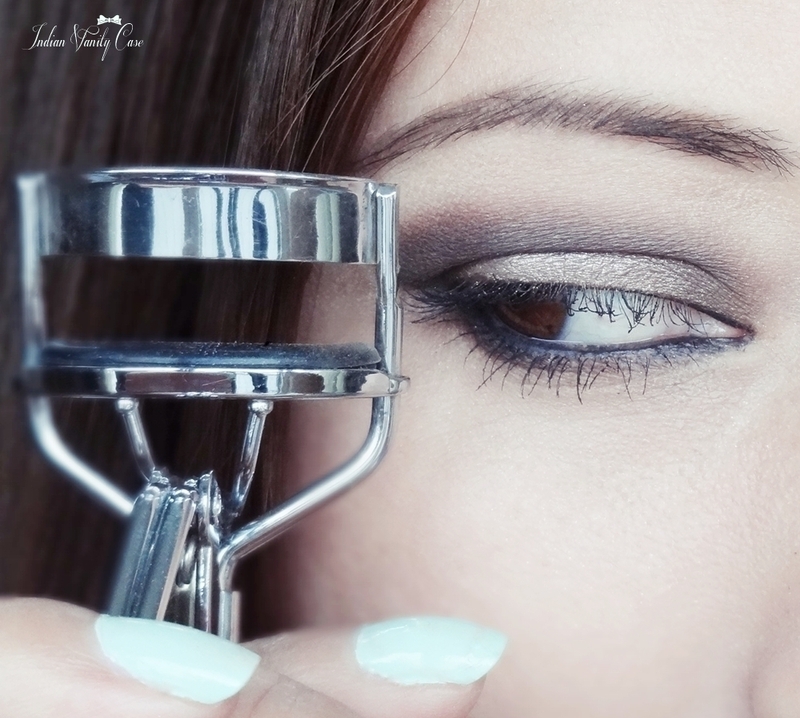 Press curler a little, and apply your eyeshadow using the edge like a ruler. Now place the top of curler over your lid. The curve is almost the same as a crease. Apply eyeshadow right on top of it. 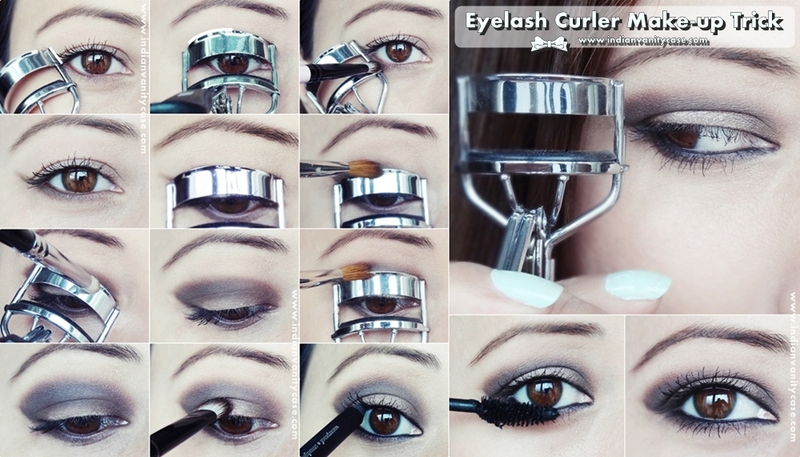 Move the curler around your lid to adjust it to the curve of your eye, until you reach the inner corners. Fill in the center with the same brown eyeshadow. You can apply all over, but I chose to leave a half moon shape bare. If you want a sharp cut-crease look, you don't need to blend the edges. But if you want a blended look, apply a lighter eyeshadow (beige or taupe) by placing the curler right on the previous brown line, and running the brush right on the top of the curler. The curler will help you stay only on the line that needs blending. Since I have hooded lids, I decided to apply a shimmery e/s (Urban Decay YDK) on the bare part of my lid. Applied mascara in bottom lash line. Remember, you can use any other eyeshadow colors- black, purple, teal, etc. I used brown, because it's more everyday-wearable. If you have a crease socket ~ you can use the eyelash curler just for the outer V. If you want a softer look, fill in your lid space with a light eyeshadow color. 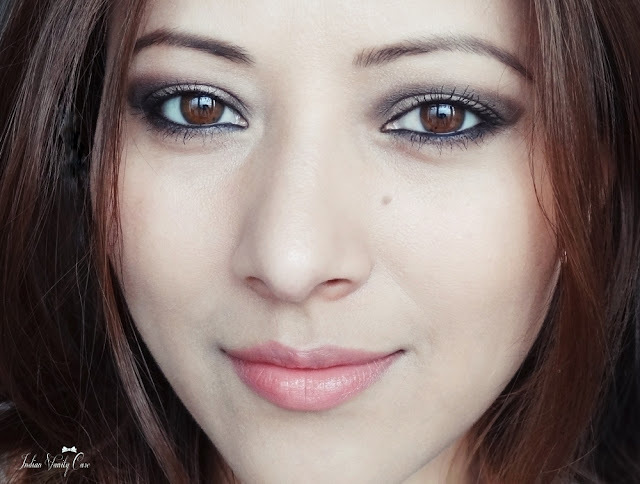 If you want an intense smoky look, you can go all out with a black eyeshadow. If you have monolids ~ Don't leave any space in your lid area, fill up the entire lid area with the brown eyeshadow. If you have hooded lids, like I do, you can apply eyeliner on your top lash line, but it's better to make it very thin. Max Factor 2000 Calorie Curved Brush Mascara. Shown here. 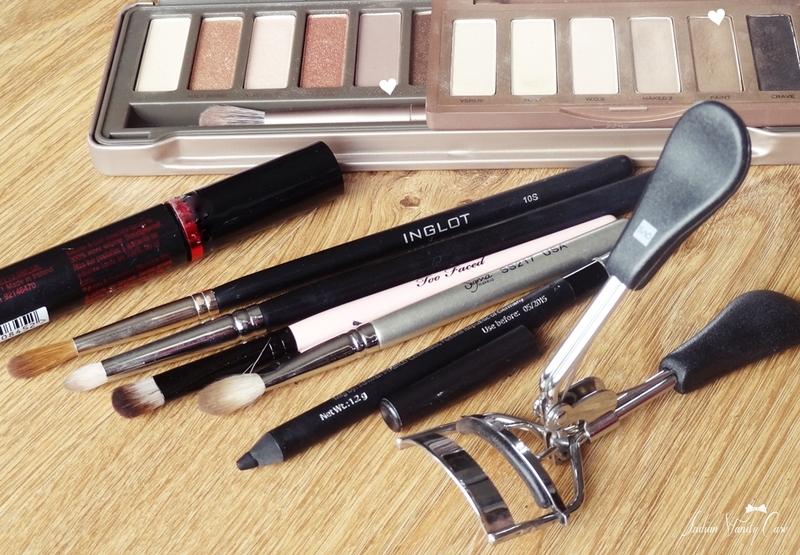 Brushes ~ Too Faced Smoker Brush, Inglot 10S, Sigma Pencil Brush. Hope you liked this tutorial. Idea occurred in February, tutorial done in June. I don't really remember what happened in between. Enjoy your weekend! I will make aloo gobi (potato + cauliflower), and watch Breaking Bad Season 2 all night. P.S. If you enjoy reading this blog, and like my tutorials, hope you have VOTED for Indian Vanity Case in Cosmopolitan Blog Awards 2013 HERE. It would help a lot. Thanks! Loved the tute. Cant wait to try myself. Thats great! Thanks also for the hooded eyes trick. Have a good weekend! i wiah you could a video tutorial of this. possible? My lids are kinda hooded too, especially on the one eye. Multi functional item :) Love how you used it!